THE MINISTER FOR Justice has said he would be in favour of legislation that would ban the photographing of gardaí in the course of their duties. Minister Charlie Flanagan, speaking to RTÉ’s Seán O’Rourke this morning, condemned online threats made against a member of An Garda Síochána at the protest on North Frederick Street last Tuesday. He said protest “must be done in a way that is lawful and peaceful”. Anything else beyond that cannot be condoned and must be condemned. Gardaí are currently investigating threats made against a garda on social media. The minister said abuse of gardaí is becoming “more and more a feature of online activity”. “Some people actually believe that online engagement is outside the law, isn’t governed by a criminal law and I believe it’s very important that we send out a message that yes, online behaviour, if it’s illegal, will be followed up by the gardaí will be prosecuted, will be detected and that will be ultimately a matter for the courts,” he said. Being member of An Garda Síochána is probably a unique challenge in our society – guards protect us, guards are the bulwark between civilised society and a breakdown in law and order. The Garda Representative Association (GRA) has proposed legislation that would make it an offence to photograph a garda while they are carrying out their duties. When asked whether he was favourable disposed towards this proposal, the minister said: “I am”. “I acknowledge the fact that gardaí need to show identification and this is an issue that arose last week and I too was somewhat concerned at images of balaclavas on the streets of Dublin. This afternoon the minister further clarified his views on Twitter, commenting that he believes transparency is vitally important. 2/3 However, I am concerned about the public order dimension of Gardaí having multiple mobile phones in their faces as they try to go about their policing https://t.co/0Zb1REwhv3 my experience press photographers are professional & do not impede Garda work. Sinn Féin TD Donnchadh O Laoghaire said the proposal was “impractical and undemocratic”. “Has the Minister even thought about how this can work; is he proposing to ban press photography of gardaí? How would you deal with the countless unintended photographs of gardaí? Will gardaí be advised not to get in to photographs with tourists? And will it be illegal to take a photograph of a community gardaí visiting a community fun day? The implications of such a proposal make it clear that it simply cannot work and is not possible to implement in a world where photography and camera phones are constantly present. The events of last week’s protest were also on the agenda for the Dublin central area this morning. Worker’s Party’s councillor Éilis Ryan said gardaí seem “extremely unclear” about their role at these protests. She said when she has called gardaí in relation to illegal evictions, they have told her it is a civil matter and they are not in a position to interfere. 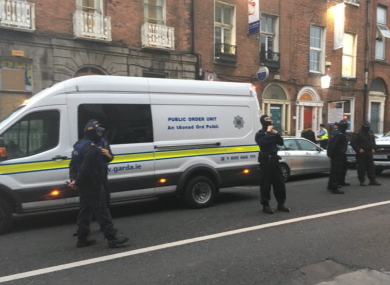 “I’ve asked a number of gardaí who’ve been present on such circumstances what duty they have to enforce the right to peaceful occupation of the tenant, they seem extremely unclear. Christy Burke said he wanted to condemn the threats made against the garda and welcomed comments from the Take Back the City group, who have also spoke out against the social media abuse. He said the council has” jobs to do” in relation to housing and that An Garda Síochána has to address its protocol for approaching such issues, which he said “are going to arise in the future”. Last week Garda Commissioner Drew Harris said he has requested a report from the Assistant Commissioner for the Dublin Metropolitan Region to “see what lessons can be learned from the event”. Email “Justice minister supports legislation to ban photographing gardaí in the course of their duties”. Feedback on “Justice minister supports legislation to ban photographing gardaí in the course of their duties”.